We went over to mum and dad's farm this weekend. It was dads birthday so we were having a takeaway meal together, my sister, brother and his wife were there as well. 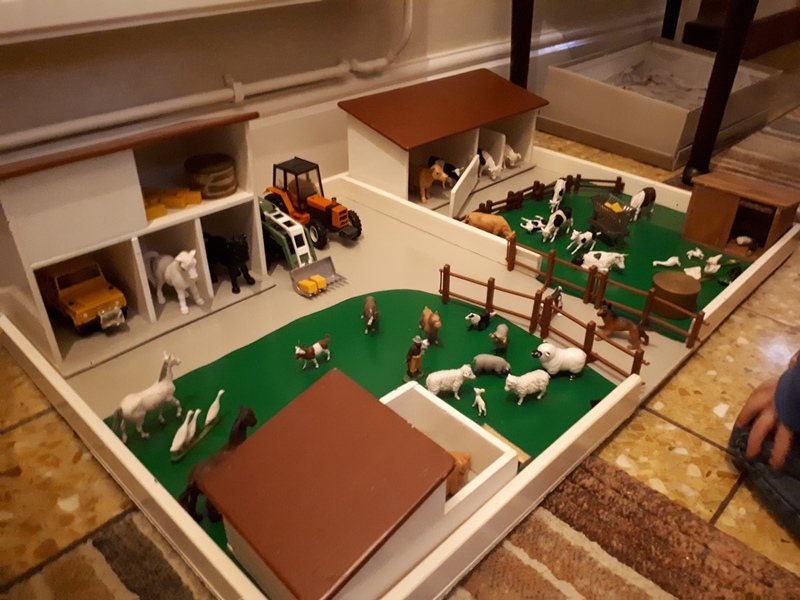 When we got there we saw that mum had got out the toy farmyard that dad had made me 31 years ago! Dad had made it for my third birthday. 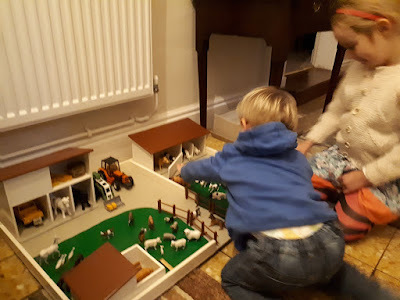 Mum had got it out of the loft and washed it all down found lots of tractors and animals to go in it. My little boy was in heaven! He had great fun moving bales around and tipping over the barns with the tractor! Unfortunately it's too big to live in our house, but it's something lovely for him to play with when he goes to grandma and granddad's! Did anyone make you toys when you were younger? My mum recycled an old sheet into a nurse's uniform for me. I had a rocking horse which my grandad had made for my mum who was born 1917. Lovely memories! Granddad made our son a love ly fort and a garage. What a wonderful legacy! My dad made my nephew a car garage which he loved. I remember he made me and my sister a fantastic wooden sledge. He also made me a lovely wooden writing box which sits on a table in the living room. It is beautiful and does actually hold my letter writing things. What an utterly charming toy! My mom made all my barbie clothes, but nothing else was handmade. My older brother once made me three Daleks using wine bottle corks and three different length matchsticks pushed into each cork. I was very pleased with them at the time. we have a Noahs ark every kid plays with it at my parents. it was the only thing we were allowed on a sunday PM. My Dad made me a beautiful dolls house for my birthday one year. I had seen the progress of the build in his little brick built shed, watching as he assembled the outer walls and added room dividers. Once he got past that stage I was barred from the shed and actually forgot all about it. When I woke up on my birthday morning sat on a table in the bedroom was the most beautiful dolls house. All wall papered, carpeted and ready for the little dolls that he had bought to move into it, along with a box of furniture that was my other birthday present. It was THE most magical of presents. What Would You Waste Less If Times Were Hard?